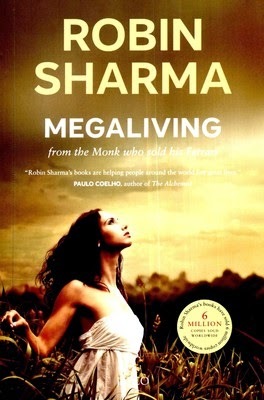 In MegaLiving: 30 Days To A Perfect Life, Robin Sharma helps his readers achieve the much-coveted, but rather elusive ‘perfect life’. This book contains information about the lives of successful CEOs, inspiring athletes, and even successful entrepreneurs, as Sharma dissects their paths in life to show his readers where the difference actually lies. The book is divided into four parts. Robin Sharma insists that each individual has the potential to lead a life filled with success, abundance, and pure joy. He says that in most people, their potential lies usually undiscovered, untapped, and untested. Through his book, he demonstrates how one can use this potential to positively and dramatically transform every aspect of one’s life. Robin Sharma provides tried and tested techniques to purge the negatives, enhance the positives, and ultimately change oneself in mind, body, and character. The four parts of the book are The MegaLiving Philosophy!, The 200 Powerful Master Secrets For MegaLiving!, The MegaLiving 30 Day Program, and The MegaLiving Success Log. The first part is divided into further subdivisions, and it encompasses topics like mastering the mind, improving one’s discipline and willpower, achieving physical mastery through diet and exercise, and attracting prosperity and wealth. The book is the culmination of ten years of research into the essence of personal mastery and successful living. It also contains a 30-day training program that’s tailored to help the reader smoothly integrate the book’s ideas and lessons into his/her life. Robin Sharma is a Canadian author, leadership speaker, and former litigation lawyer. Sharma is considered to be one among the Top 5 Leadership Experts in the world. He has written eleven books, some of which are: The Leader Who Had No Title, The Monk Who Sold His Ferrari, The Saint, The Surfer And The CEO, Family Wisdom, Who Will Cry When You Die?, The Greatness Guide, and Leadership Wisdom. His writing is inspirational, and he teaches people how to take control of their lives through his books. His eleven books have gone on to become international bestsellers. His books have been translated to almost 70 languages and have been sold in over 60 countries. Sharma holds a Master’s degree in Law from Dalhousie Law School. He quit his job as a litigation lawyer and self-published his first book. His second book, The Monk Who Sold His Ferrari, also self-published, catapulted him into the big league. The Sharma Leadership International Inc. is a global consultancy founded by Robin Sharma that helps people take on the roles of leaders in different organizations. Its clients include IBM, FedEx, Microsoft, and Nike.